Now in the hands of her Lord, Pierina passed away early morning on September 14, 2016. Preceded in death by John, her husband of 67 years; parents Francesco and Maria; sister Enis, and brothers Oreste and Silvano; loving Aunt Caterina and Uncle Giovanni (Tita); Brother-in-law Onorio; an infant son; daughter Anne (Robert) Hefter; and grandchildren Michael Richmond and Michael Davis. Precious Mother of John F. (Janis), Anthony (Mary Sue), Mary (Tom) Schubert, Kathryn Ferguson, Joanne Johnson (Donald) Clauser, Rita (Jimmie) Richmond, and William (Kay). Further survived by 17 grandchildren, 36 great-grandchildren, 3 great-great-grandchildren; Sisters-in-law Lara and Josepina (Pina); and many other family members and friends. Pierina was an amazing person. Born October 10, 1927 in Villesse, Italy, she was raised by her Aunt Caterina and Uncle Tita after her mother died shortly after giving birth. She witnessed the horrors of WWII and experienced the joy of falling in love with John, a handsome American soldier. They married; and as a WWII War Bride she came to the US, settling in Upper Michigan near her in-laws. Every few years she returned to Italy to visit family and friends, twice with several of her children; and every-so-often hosted family members in their home; she is the only member of her Italian family to ever have lived in the US. Pierina taught herself English and became a US citizen in 1955. For a time she and John operated a small 80- acre dairy farm, raising cows, chickens, sheep and geese, and tending a large garden. It was here they started their family, making the newspapers with the births of a third set of twins. Between 1960-72 they built three homes in Grafton, Pierina acting as ‘unofficial contractor’ to ensure each was to her specifications. 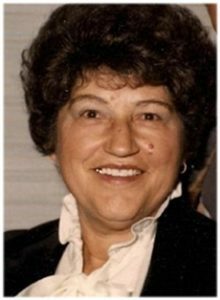 A devout Catholic all her life, at home Pierina was a mother, cook, baker, seamstress, and wife; outside the house she was a nurse’s aide; a factory worker, (retired from Orion Corp.), and for a short while as a TSA security guard. She and John lived 15 years in Las Vegas where they polka danced, took tours, grew fabulous roses and fruit trees, hosted family members, and played the casinos (a favorite pastime). In 2006 they returned to Grafton to be nearer their children and other family members. Pierina extends special appreciation to daughter Kathryn for her care; to St. Joseph Church Ministers of Care (Arlene, Kathy, and Mary) for weekly visits and Gospel support; and to Ellen’s Home staff for their fun, interactive programs and care. She leaves loving thoughts to all her children; each has a special place in her heart. She already is, and will always be, greatly missed. Memorials to St. Joseph Catholic Church Grafton, or Ellen’s Home Port Washington appreciated.